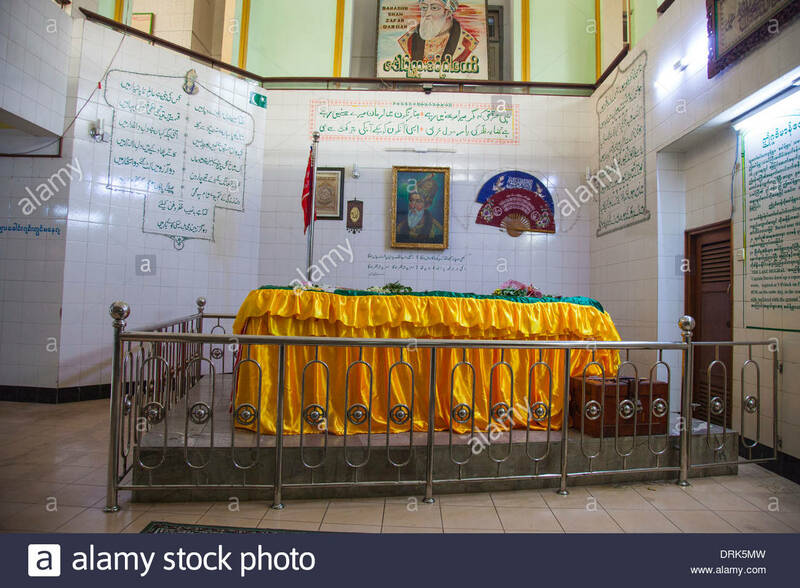 Mirza Abu Zafar Siraj-ud-din Muhammad Bahadur Shah Zafar (24 October 1775 – 7 November 1862), being the second son and successor to his father Akbar II after his death on 28 September 1837, was the last Mogul ruler in the Indian subcontinent. 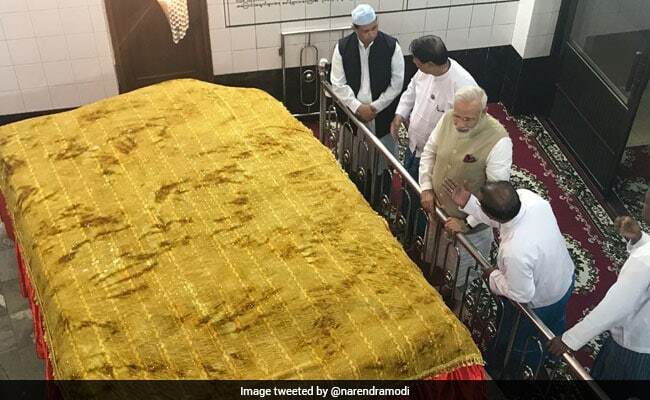 Unfortunately, not withstanding his being a ruler of the once most powerful dynasty his regal authority and power were confined only to the walled city of Old Delhi (Shahjahanbad). 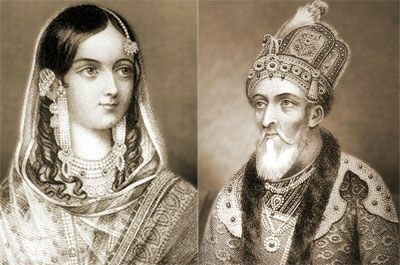 The East India company dishonestly took away many Indian kingdoms and the mogul empire was not an exception Bahadur Shah's relationship with his father was not a cordial one and it was his mother Mumtaz Begum who compelled Akbar II to declare her son, Mirza Jahangir, as his successor. He was not his father's preferred choice as his successor. In the wake of the Indian rebellion of 1857 against the oppressive EIC rule, Bahadur Shah got a bad rap though he was not involved directly except for the the fact that he was, just for name sake, the head of the rebellion as he happened to be a well-respected Mogul ruler accepted both by the Hindus , Muslims and others. Many violent incidents took place against the East India company officials and the army and the British assumption was that they were carried out under the direction of Bahadur Shah. Very much perturbed by the violence let loose by the rebels, the Mogul ruler wanted to distance himself as he preferred a peaceful protest. Quite irritated, the EIC officials arrested Bahadur and sentenced him to spend the rest of his life in exile; he was sent to Rangoon, in British-controlled Burma (now in Myanmar), after convicting him on conspiracy charges. Earlier, the East India Company exiled Jahangir after he attacked their resident in the Red Fort, paving the way for Zafar to assume the throne. 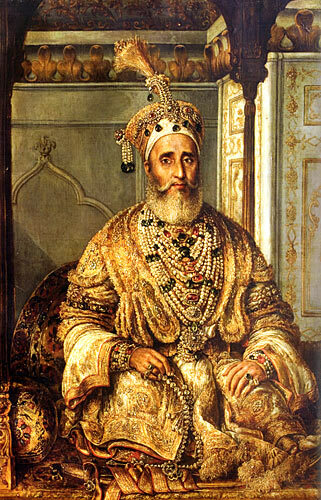 Now, the same British company stripped his regal power and and sent him to Burma. .
Bahadur Shah Zafar of the Mogul dynasty was known as the king of Delhi to Palam. The Mogul empire became fragmented for various reasons. The Maratha Empire rendered the Mogul empire powerless in the deccan in the 18th century and the regions of India under Mughal rule had either been taken over by the Marathas or declared independence and turned into smaller kingdoms. The Marathas installed Shah Alam II in the throne in 1772, under the protection of the Maratha General Mahadaji Shinde and maintained suzerainty over Mogul affairs in Delhi. The East India Company became the dominant political and military power in mid-nineteenth-century India. Outside the region controlled by the Company, hundreds of kingdoms and principalities, fragmented their land. However, the Mogul emperor was respected by the English Company and gave him a pension to maintain his family and his retinue. The emperor gave the Company the rights to collect taxes from Delhi and maintain a military force in it. Zafar never had any interest in the affairs of the state. Nor did he have any "imperial ambition" to recapture or expand his rule. By chance he had to lead the Indian Rebellion of 1857 against the British and the hell-bent mobs were indulged in violence which he never approved. Nor were the rebels instigated by him. Fate had it that he carried the stigma of having instigated the violence against the company rule. When the British were on the verge of putting down the rebellion across the north Indian states, in particular Delhi, Zafar took refuge at Humayun's Tomb on the outskirts of Delhi. Major William Hodson, a hot-headed, merciless military officer led the army and arrested Zafar on 20 September 1857 and on the following day Hodson brought his sons Mirza Mughal and Mirza Khizr Sultan, and grandson Mirza Abu Bakr under his own authority on a bullock cart and near the Khooni Darwaza near the Delhi Gate, in a flash, shot them dead point blank without any prior warning. Severed heads of his three sons and grandson were brought before him and it is believed, they were hung near the gate for several days, a sort of warning to those who would resort to revolting against the British authority. Hodson happened to be a cold-blooded murderer and Gen. Reginald Dyer of Jallianwallah Bagh massacre (1913) fame surpassed him in mass murder by driving the innocent people like cattle on a ranch before a shower of bullets at he only exit gate. These two go down in Indian history as the bloodiest and cold-blooded murderers of Indian people. As of today either the British Crown or the British Government apologized to the Indian people for the wrong committed by their forefathers in the past. A simple note of sorry will suffice. Perhaps magnanimity may be an anathema to the race-conscious British administration!! The trial on the Indian rebellion took place at the Delhi Red Fort and lasted for 41 days, had 19 hearings, 21 witnesses and over a hundred documents in Persian and Urdu, with their English translations, were produced in the court. It was the first case to be tried at the Red Fort. The EIC meetings were normally held in Calcutta with respect to commercial dealings. 01. Aiding and abetting the rebels of the troops, 02. Encouraging and instigating war against the British Government, 03. Assuming the sovereignty of Hindoostan and 04. Causing and being accessory to the murder of the Christians. ........... Proceedings of the April 1858 Trial of Bahadur Shah Zafar 'King of Delhi. Bahadur Shah II' contention that he was helpless before the rebels who apparently used to affix his seal on empty envelopes, the contents of which he was absolutely unaware of. The eighty-two year old poet-king was so harassed by the rebels he was neither willing nor capable of providing any real leadership. His polite argument before the trial court on the 20th day was of no use and he could not prove neither his innocence nor his disapproval of violence against the English. The trial was biased and the Emperor's age, frail nature and lack of assertiveness never drew the attention of the trial court. One Hakim Ahsanullah Khan, Zafar's most trusted confidant and both his Prime Minister and personal physician, under duress, betrayed him by providing evidence against him at the trial in return for a pardon for himself. Responding to Hodson's guarantee on his surrender, Zafar was not sentenced to death but exiled to Rangoon, Burma, where he died in November 1862 at the age of 87. His wife Zeenat Mahal and some of the remaining members of the family went along with him. 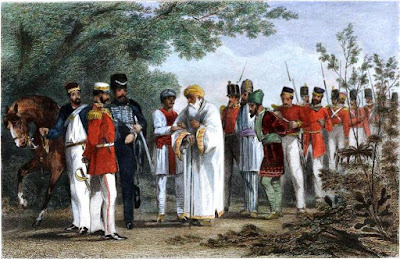 The British treated the last Mogul ruler in a shabby manner by taking him and others at 4 a.m on 7 October 1858 to Rangoon, Burma in bullock carts escorted by 9th Lancers under command of Lieutenant Ommaney. Zafar died on Friday, 7 November 1862 at 5 am and was buried at 4 pm near the Shwe Degon Pagoda at 6 Ziwaka Road, near the intersection with Shwe Degon Pagoda road, Yangon. 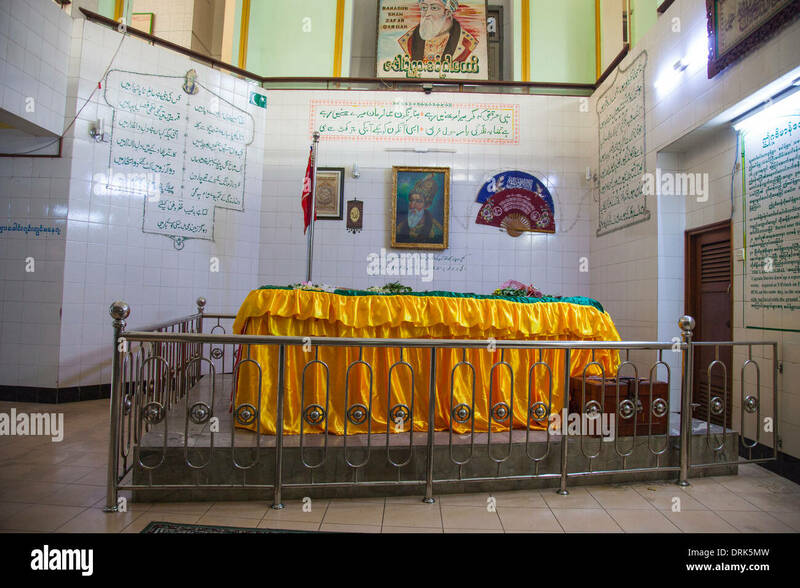 The shrine of Bahadur Shah Zafar Dargah was built there after recovery of its tomb on 16 February 1991. 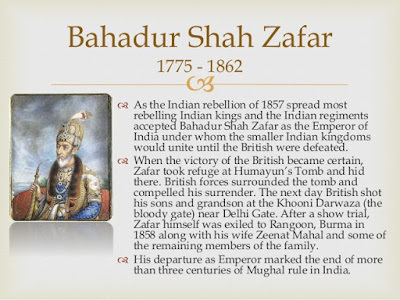 Bahadur Shah Zafar was a well-known Urdu poet, having written a number of Urdu ghazals. Unfortunately a part of his work was was lost during the tumultuous Indian Rebellion of 1857. However, a large collection of his works did survive, and was compiled into the Kulliyyat-i-Zafar. The court that he maintained was home to several prolific Urdu writers, including Mirza Ghalib, Dagh, Mumin, and Zauq. Soon after the Indian rebellion, the greedy occupying English Army ransacked the Red Fort and stole anything that was valuable - ancient objects, jewels, books and other cultural items were taken which can be found in various museums in Britain. For example, the Crown of Bahadur Shah II is a part of the Royal Collection in London. Thus, the British Empire across the world was built amidst murder and mayhem, dishonest wheeling dealing, treachery and treason, and waling of millions of people, in particular Indians. Every exhibit in the British Museum from the Indian subcontinent and other places is stained with blood and curses.